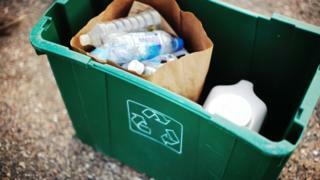 A council has spent more than £300,000 renting storage space for thousands of unused waste bins and other recycling equipment, it has been revealed. The items were bought in 2012 for a new multi-bin collection system due to roll out across Dumfries and Galloway. However, the new kerbside service has been hit by a series of problems and only operates in Wigtownshire so far. As a result, thousands of new waste bins have had to be held in storage for the local authority. A report to the council's economy, environment and infrastructure committee said there were no suitable council facilities available to house the containers and the authority has had to rent a hangar from a local firm. Councillors are being asked to agree an additional 12-month lease of the premises at a fixed-price of £50,000.